1663 DANIEL S. CARL. The history of that interesting locality of Finney County known as Imperial is largely told in the record of the Carl family, who have lived there since March, 1887. The postoffice of Imperial has been housed in the Carl home since 1889. As a prominent man of this district the experiences of Daniel S. Carl deserve more than casual notice. He was born in Perry County, Pennsylvania, August 9, 1851. He is of German ancestry. His grandfather was a German who spelled the name Korl. The grandfather was a farmer. He married a Miss Hackett, and they had six sons and three daughters. Christian Carl, father of Daniel S., was also a native of Perry County, Pennsylvania. He was a mechanic, stone mason and brick layer, but in 1858, when Daniel S. was seven years of age, moved out to Iowa and there became a farmer. He spent the rest of his life in Iowa and died in Cedar County at the age of sixty-eight. He began voting as a democrat, afterwards joined the know nothing party, and finally was a republican. He was a member of the German Reformed Church. Christian Carl married Sarah Kell, daughter of Philip Kell of York County, Pennsylvania, and also of German ancestry. Mrs. Christian Carl died in Cedar County, Iowa. Her children were: Mrs. Matilda Dafford, special reference to whom is made later; Martha J., who married Mr. Bretts and died at Oakdale, Nebraska; Mrs. Emeline Long, who died in Washington County, Iowa; Jeremiah H., of Muscatine, Iowa; Catherine, who died as Mrs. George Sweet, of Louisa County, Iowa; Julia Ann, who married David Hilligast and died in Poweshiek County, Iowa; Daniel S.; Neven P., of Vinton, Iowa; and Floy E., who married George Herr and died in Cedar County, Iowa. Daniel S. Carl received his education in the common schools of Washington County, Iowa. On leaving that state he spent four years in the far West along the Pacific Coast. The summer of 1873 was passed in Wyoming and Utah, where he worked as a "bull whacker." He then went into the Sacramento Valley, found labor chiefly as a farm hand for eight months, and from there proceeded to Umatilla County, Oregon, for a time broke wild horses for a stage company, and also drove stage for the Northwestern Stage Company from The Dalles through Pendleton, Grand Round Valley, on to Boise City and through the desert to Kelton, Utah. In that country he spent about sixteen months. On one of those trips in 1874 he found a lost sister who had left home as a young woman before the war and had gone to Oregon, becoming separated from her family. This sister is Mrs. Matilda E. Dafford, now making her home with her brother at Imperial. Leaving the western country January 2, 1876, Mr. Carl went down the Columbia River, crossed Puget Sound, thence down the coast to San Francisco, and made the transcontinental journey to Philadelphia to the Centennial Exposition. Spending the summer in Philadelphia, he then returned home, visiting his people in Washington County, Iowa; from there he went down to Kansas City, Missouri, and hired out in Johnson County, Kansas, as a farm hand. That was his work during the winter, and he then started farming on the shares, keeping that up for three years. At that point in his career Mr. Carl left Kansas, went back to Pennsylvania, and in Juniata County on Christmas day, December 25, 1879, married Miss Maria S. Sherlock. Her parents were John and Margaret Sherlock of the Tuscarora Valley of Juniata County, fifty miles west of Harrisburg. Mrs. Carl was born in that valley June 6, 1854, was well educated and taught school there. While it is anticipating this record somewhat, it should here he stated that Mrs. Carl has been as active in social and educational and civic affairs in the Imperial locality as any other settler, and has also contributed nobly to the success of the family here. 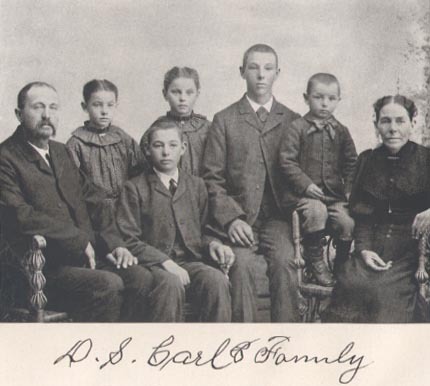 After his marriage Mr. Carl brought his bride to Kansas, establishing his first home near Lenexa, and later near Olathe. During the ten years he spent in Johnson County he was chiefly a tenant farmer. It was for the purpose of bettering his condition that he brought his family out to the frontier of Finney County in March, 1887. He shipped a carload of goods, including four horses, a few pigs, three dozen chickens, besides household goods. His cash capital amounted to a thousand dollars. That kept him until he could become acclimated to this district. Mr. Carl pre-empted the northeast quarter of section 4 in Finney County and built his first home there. He proved up his pre-emption and subsequently homesteaded the northwest quarter of section 3, both in township 21, range 30. These two quarter sections constituted his farming area for a number of years, and while there he and his family suffered the hard period of their Kansas existence. There were privations and hardships without number, and, they and the Chalfont family, neighbors, were for a time the only people who had the nerve and the foresight to remain in this region and face the continued drought and hardship. Mr. Carl first built a sod house and stable, the house having a single room. A year later it was added to, making a three-room soddy. That sheltered the family for fourteen years. The first summer they spent here they and their neighbors sought a place to hold meetings and Sabbath School. These religious devotions were held under the leadership of the pioneer pastor Turney. The first church and Sabbath School were held in Mr. Carl's stable. This stable was built of sod and was sixteen feet wide and forty feet long, covered over with boards, being a somewhat roomy and well adapted place for the purpose. It had really served as the family home during the first summer. All the people of the neighborhood, without regard to religious classification, came together for a union service, and Rev. Mr. Turney preached in this barn and also in the sod schoolhouse which the Carls and their neighbors subsequently built. It was Mr. Carl's intention when he came to Finney County to farm as he had done in Johnson County. For that reason he brought some pigs along. Disappointment was in store for him, since the only harvest for several years was roughness. About all the family had to sell was a little surplus butter and eggs. Mr. Carl bought his first cow in this neighborhood, and she was the nucleus of his gradually developed herd of cattle. Save for a small surplus, all his dairy products were consumed at home. There came years when Mr. Carl found all his surplus cash exhausted and there was nothing to sell from his farm in order to get more. He began sowing wheat in 1890 and in 1891 a good crop ripened, though it was lost by hail. Notwithstanding the loss, he felt encouraged to know wheat would grow and ripen in the country and make a yield of eighteen bushels to the acre. Since then he has sowed wheat every year, and on the whole it has proved a paying venture. His best yield was thirty bushels to the acre on a ninety-acre field in 1903. However, failures from drought, hail and winds have been numerous. This crop he has sold as low as thirty-five cents a bushel, while in 1916 a large quantity was taken out of his granary at a dollar eighty cents a bushel. Taking the aggregate of years, Mr. Carl's prosperity in Kansas has been an unusual one. It is due to a combination of farming, with stock raising as an important feature. He has been in recent years developing a herd of blooded cattle. These are a cross between his Shorthorn cows with Angus males, and the result is an animal large and hearty and hardy and easy to keep. A look at his cattle indicates at once the reason why they grade well to the top at the market. Probably a dozen years passed before Mr. Carl began adding to his land holdings. His boundaries have been extended until his ownership now covers seven quarter sections, with five hundred acres under the plow. His present fine eleven-room house succeeded the old sod shelter in 1890. At different times, as they have been required, barns and sheds have been constructed, and his farm represents a large cash capital invested in material and labor. Mr. Carl's home is in the sheet water district of Kansas. A hundred feet from the surface is found a strong flow and ample supply of pure and wholesome water. Mr. Carl and his wife helped organize school district No. 4, the Imperial District, and later commonly known as Carl's District. Until 1917 this district made use of a makeshift schoolhouse, though Mrs. Carl was constantly battling for a new and real schoolhouse. Her desires have just been gratified. In all this time the Carl home had to serve as the place for public meetings and other gatherings outside of church, but with the new schoolhouse on Mr. Carl's tree claim these gatherings now have a more convenient and a more public place. When nearly all the people left this section Mr. Carl and his wife had to serve together on the school board in order to comply with the law and keep up the semblance of a school. Mr. Carl also served as township clerk, and for a long time was almost the head and front of the republican party of this locality. He attended two state conventions, helped nominate Mr. Hoch for governor, and attended the Wichita convention to select delegates to the National Republican Convention which nominated President McKinley for the first time. The record of these worthy people of Imperial may properly conclude with some brief reference to their family of children. Harry G., the oldest, was born in October, 1880; was educated in the Central Kansas Normal College, helped at home until his parents became independent, then spent some time in Colorado in different employment, and is now again at home. Forest T., a farmer living near his parents, was a student in the Central Kansas Normal College and spent a year in the Kansas Wesleyan at Salina. He married Beth Felkner. The daughter, Opal Pearl, died in childhood. Cecil and Ethel are twins, both graduates of the Kansas State Normal in 1913, and taught in the public schools both before and after graduation. The daughter Cecil is now Mrs. H. E. Wristen, of Dighton, and has a son, Carl Edward, and daughter, Ethel May. Ethel was the wife of Ralph Waldo Graves, of Lane County, postmaster of Sutton and a farmer. She died February 18, 1918, leaving a son, Eugene Wilbur. The youngest of the family is Plumb D., who finished his education in the Kansas State Normal, leaving that school in the junior class, and is now a factor on the family ranch.